Education is like a ladder. It enables a person to climb to greater heights—both in their careers and their lives. An effective education strategy can also enable a business to climb to new heights, as staff members are better able to contribute to business success. 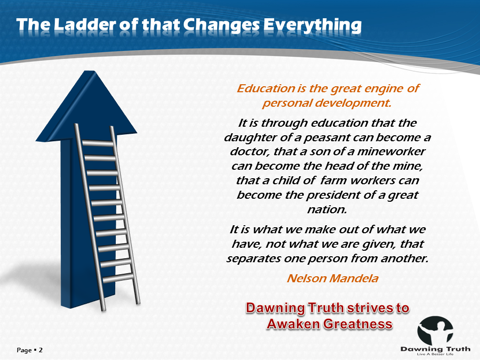 Dawning Truth has the expertise and technical knowledge required to enable your staff to grow to the next level. Most notably, we have expertise in accelerated learning and thinking, engineering high-IQ research and the principles of greatness. Accelerated learning enables us to accelerate the learning process through specialised methods of course design and knowledge packaging. Thinking engineering enables us to design smarter ways to think. Furthermore, it provides us with tools for structuring understanding in order to dramatically enhance the learning experience. Our high-IQ research is derived from studying the smartest people on Earth, some of them with IQs over 175. We understand how intelligence is structured and how to develop training courses that can enhance your skills and capability. We have spent 14 years studying the greatest achievers in history. We consistently incorporate lessons learnt from this research into our training programmes. 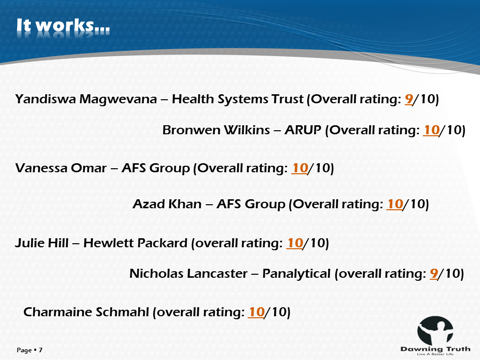 This enables your staff to be optimally equipped for meaningful enhancement in performance. 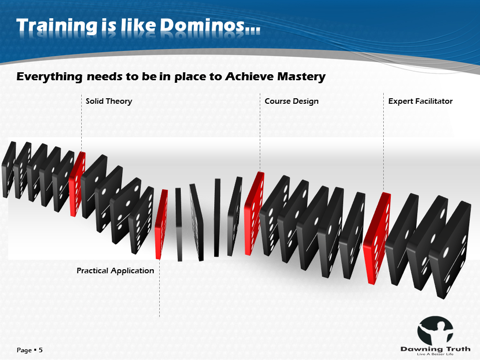 Effective training is like playing dominos. You need to have all of the right elements in place for all of the dominos to fall and for a powerful result to be achieved. Firstly, you have to have a solid theory. Good training requires good theory — insightful principles and concepts that work in the real world need to be taught. Secondly, you need practical application. Dawning Truth’s courses deliver real-world skills. The development of these skills is achieved through practical life-like exercises that mimic reality and the challenges encountered by your staff. Thirdly, you need an interesting and engaging course design. Courses need to be designed in a brain-friendly manner that keeps the audience’s attention and creates a desire to learn and grow. 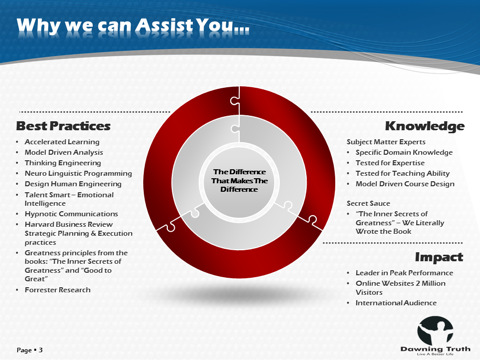 Finally, you need expert facilitators who have many years of real-world practical experience doing the job. For instance, our PA facilitator has over 10 years of PA experience at the senior level. She is truly one of the best PAs in the business!